Loss, hunger and mass displacement are just some of the problems of a natural disaster. With tens of thousands of hurricane survivors crowd into shelters and others refusing or unable to leave spots contaminated by floodwaters, disease plays a major problem. One outcome of standing in cold water for long periods of time is the architecture of the feet collapse with a condition known as Trench Foot. This does not discriminate and both survivor and rescuer are prone to the conditions. There are various stages of Trench foot, the first being the foot becomes hot and swollen often with bleeding under the skin (hyperaemic stage). This may be complicated with spreading infection (cellulitis, lymphangitis, and thrombophlebitis). In the late stages (vasospastic) the feet become very painful with excessive sweating and paraesthesia. These symptoms may last for years. Keeping the feet warm and dry is critical but often impossible. This condition was first discovered during World War I when soldiers’ legs and feet were immersed in cold muddy waters for weeks on end. Their ligaments gave way and the feet collapsed. Solders were literally unable to move. More and more complained of symptoms ranging from cold feet, pins and needles (paraesthesia) to no feeling whatsoever. Walking in severe causes was impossible. Soldiers were unable for combat and as the casualties mounted more serious attention was given to foot hygiene. 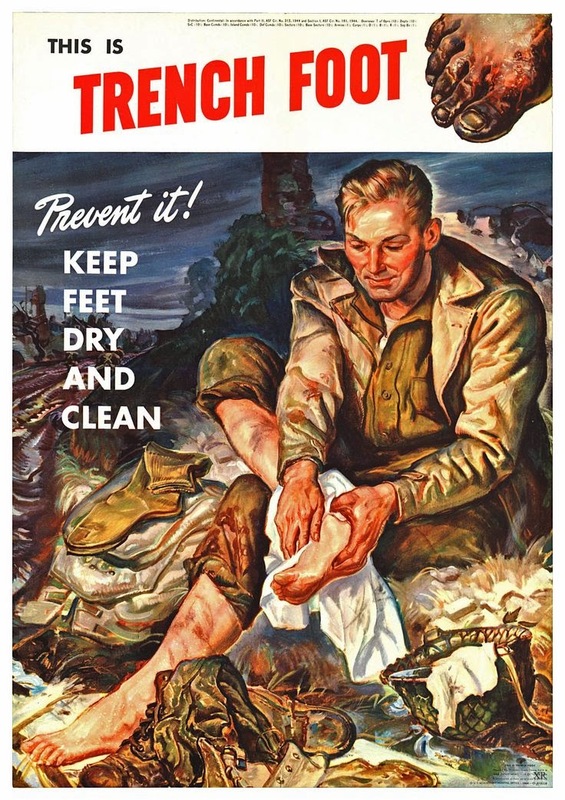 In the Second World War Trench Foot returned and many GIs suffered during the long cold European winters. 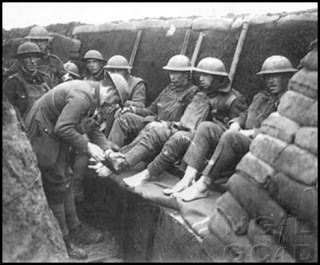 Such concerns were given to prevention of Trench Foot that soldiers were ordered to sleep with their socks and shoes on. 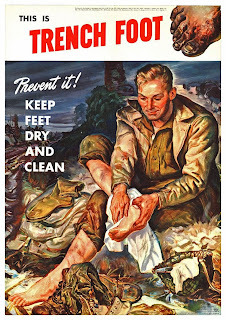 Many victims were thought to have encouraged Trench Foot by deliberately exposing their feet to severe elements in the hope of being excused combat duty. Official records confirm there were more casualties to the disease than soldiers wounded by enemy fire. 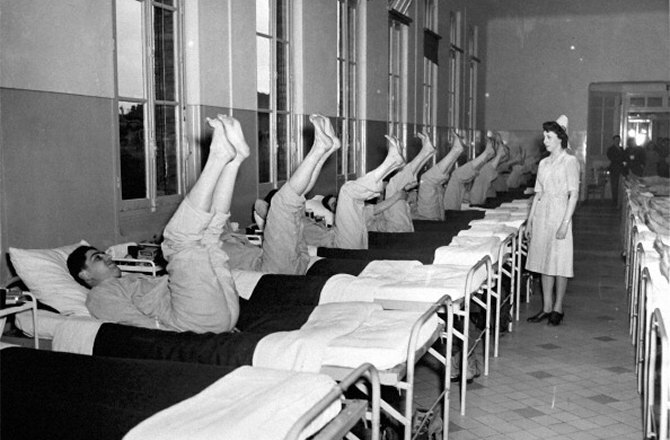 In the combat zone not looking after the feet became a court martial offence. A morbid and sordid fact of war was the boots of the dead were removed in order to continue combat. 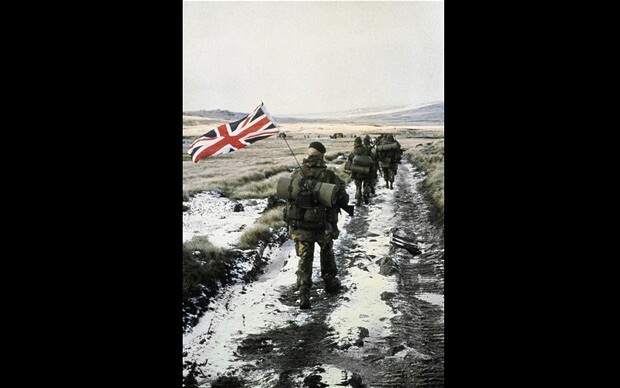 In the Falklands War there was a reoccurrence of Trench Foot because the boots of the British Forces' were unsuitable for the weather conditions. Some military experts have postulated had the Argentineans been prepared to prolong hostilities they would have won because of the British casualties to Trench Foot. A similar condition known as Immersion Foot is associated with prolonged exposure to warm and wet conditions. This was common in Second World War and Vietnam, where fighting in the jungle swamps necessitated combatants remained in warm moist conditions for long periods of time. Immersion Foot was seen more recently in Tsunami disasters. According to the Department of Health and Human Sciences, Centres for Disease Control and Prevention treatment for Trench Foot and Immersion Foot are preventable by simple steps. 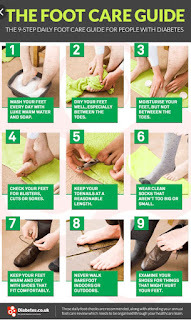 Keeping the feet clean and dry and wearing warm socks. Cheap medical grade thermoplastic insoles (e.g. plastazote) are similar to material used to insulate houses, and superb for keeping the feet warm. Frostbite is another serious condition which affects the extremities. This describes tissue death (necrosis) and is caused by exposure to subfreezing temperatures. Depending on the degree of frostbite determines symptoms. Fourth degree frostbite usually results in auto amputation. Just to bring this problem even closer to home spare a thought for the many homeless who are living rough in our towns and cities. Many live with the dangers of Trench Foot and Frost Bite.